This is our Used Auto-Sleeper Mercedes Winchcombe Automatic 2017/17 – a luxury 2 berth, low-profile, coach-built motor home by Auto-Sleepers. This stunning 1 owner example was supplied by us and was first registered in May 2017. It has been serviced from new by us and has covered 6,550 miles. 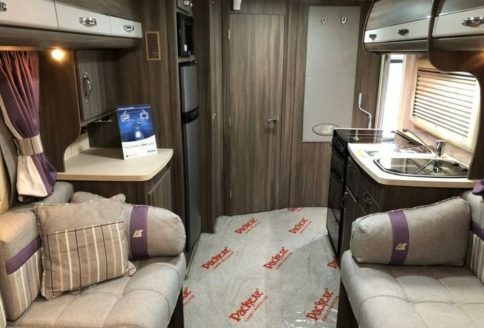 The luxurious Winchcombe layout features a spacious end bathroom with separate shower and a fabulous, large spacious lounge with twin opposing sofas and swivelling cab seats. Sleeping is either as 2 large single beds or as a huge double bed. 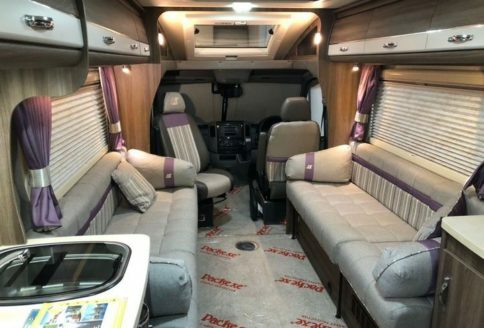 Our Winchcombe has a very impressive specification which includes cab air conditioning as well as an awning, a cycle rack, i-net compatibility, colour reversing camera, cruise control and electric windows, as well as alloy wheels and fully automatic transmission. Mercedes use their powerful 2.2, 163 bhp turbo diesel and the Winchcombe’s rear wheel drive too offering added stability and optimum control and comfort. 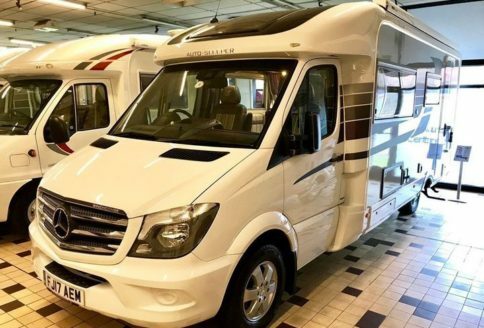 Our Used Auto-Sleeper Mercedes Winchcombe Automatic 2017/17 Plate, as with all Auto-Sleepers, is a very impressive motorhome. 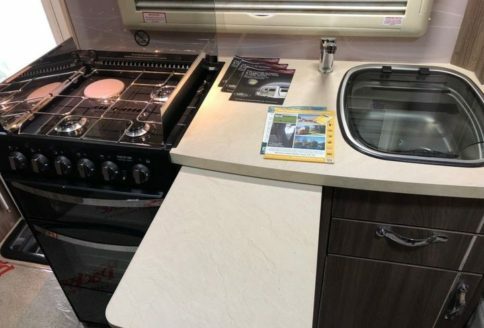 For those who enjoy cooking, the kitchen features a full-size cooker with dual fuel hob and separate oven and grill. There’s an electric hood overhead that deals with cooking smells and a dual-zone microwave oven too. Finally, the kitchen is completed with a large, three-way fridge and separate freezer above and a useful slide-out towel rail too. For driving convenience, the Winchcombe cab specification includes electric door mirrors, a colour reversing camera and an adjustable steering column. Removable carpets, including in the cab are standard throughout and there’s also central locking and a cab alarm and engine immobiliser too. Our Winchcombe also features a quality alarm system for added security and both cab seats swivel for relaxing when the driving stops. The Winchcombe has ample storage and it’s found in lots of places. There’s ample free space under the lounge sofas while several overhead lockers provide even more space. There are cupboards under the kitchen work surface and the bathroom has a large wardrobe and drawers too, so you’re never going to be short of storage space. The Lounge is light and airy, a very comfortable space for relaxing day or night and as mentioned, the cab seats swivel. There’s a large, opening sky-view window over the cab and extra-large side windows and equally large rooflight too. 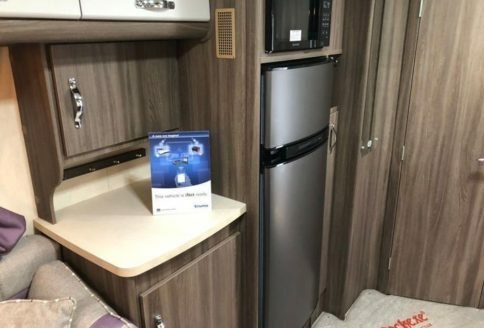 The “Truma Combi 6” heating system provides more than enough heat for any conditions and is i-net compatible so, with the “trauma” app, can be controlled from a mobile telephone when you’re away from the motorhome. 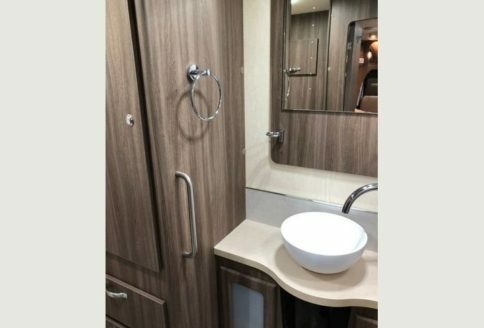 The van has Auto-Sleeper’s beautiful “Catalan Berry” soft furnishings and their luxurious “Valencia” cabinets and furniture. The large end shower room comprises a cassette toilet, stylish feature sink and separate shower cubicle. As the shower is a fully enclosed cubicle, when used, the rest of the room remains dry. Warm air from the heating system is ducted to the bathroom for added comfort. The Devil in The Detail Perhaps? Well, fortunately for everyone, there are no “Devils” lurking within a Winchcombe! But it does have a full-length wind-out awning, as well as a handy towbar, additional external security lock and grab-handle and free-standing table for use inside or out. Winchcombe’s also have rear wind-down steadies for stability when parked. LED lighting is standard as well as over-locker mood-lighting too. Fabrics are luxurious Belgian fabrics with high quality furniture too; there’s even a safe for added security! Useful outside features include an external gas bbq point, dual-fill water system, external 230v plug socket (very handy) and a chassis mounted refillable LPG gas tank too – no gas bottles to mess around with here! On the roof is an 80w solar panel and digital TV aerial, while there’s an electric step to ease getting in and out of the motorhome. There’s a Mercedes alarm system for the cab as well as a high-quality after-market system too. There’s also central locking all around including the habitation door. Treat yourself to a bit of real luxury this year and make a sizeable saving from new model too. Part exchanges are always a pleasure.